The current issue of CE National’s e-newsletter notes that former Grace Brethren Church youth pastor, Brian Orme (pictured), has been named editor of Outreach Magazine. Brian directs the editorial team for the magazine and the Outreach Web properties. Brian was on staff at Community Grace Brethren Church in West Milton, Ohio, for 11 years. He still lives in the Dayton area with his wife, Jenna, and their three boys. 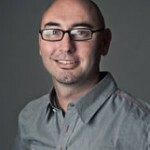 Brian began with Outreach in 2010 as founding editor of churchleaders.com. Also associated with Outreach Magazine is former CE National employee, James Long. Jim and his wife, Harriet, were from California and attended Biola University. Jim then became a writer and editor of various books and publications. He is now managing editor of Outreach Magazine overseeing the production and content of the magazine. CE National’s director Ed Lewis says he always appreciates the work of Outreach Magazine. “What a great resource,” says Ed.